Detroit Lakes, MN – The drunkenly popular WE Fest celebration of country music at the Soo Pass Ranch has been cancelled for 2014 due to serious health concerns. The annual outdoor music festival was scheduled for August 7-8-9 but fans will have to wait until 2015 to see their favorite country music stars, such as Travis Tritt and Brad Paisley. 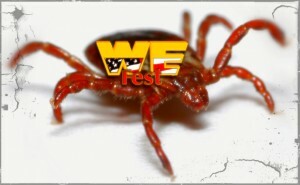 Minnesota health officials have discovered a massive infestation of ticks carrying a deadly disease which causes an acute inflammation of the spleen. UPDATE: This post is completely fictitious (not real). WE Fest 2014 has not been cancelled. Click here for another exciting Dr. Willy Nilly post!